Insect species associated with human goods continue to be accidentally introduced into new locations. A small proportion of these introduced species become invasive, causing a range of impacts in the receiving community. It is therefore important to evaluate the patterns of which species become invasive and which strategies are most successful in managing them. This review assesses the distribution, abundance, impact and management of the invasive Vespidae worldwide. We identified 34 vespid species known to be introduced around the world, but the seven most invasive species are all eusocial. Most introduced Vespidae only occur in one or two countries, but some areas have become geographic hotspots of invasion: Hawaii (15 species), North America (eight species), New Zealand (five species), Australia (four species) and South America (four species). Two invasive species, Vespula vulgaris and V. germanica have become particularly widespread and abundant with a range of impacts on biodiversity and ecosystem function. Other successful invasive species include several Polistes spp., which affect local biodiversity through direct predation or competition for food or space. Toxic baiting has been the most successful control strategy against invasive vespids to date, although this has mostly been small scale experimental management as it has proved difficult to develop commercial control products. Development of shelf-stable lures or baits combined with suitable toxins or pathogens could overcome some of the commercial impediments. 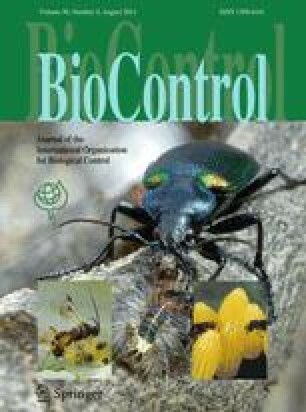 Several attempts at biological control using parasitoids have not successfully reduced invasive wasp populations, although the biocontrol agent has only established in one case. The social structure of colonies and their high reproductive efficiency have facilitated invasion by these species, but it also means management at the population level will be difficult. This emphasises the need to prevent such invasions from occurring in the first place. J. Beggs was funded by the University of Auckland; E. Brockerhoff by New Zealand’s Foundation for Research, Science and Technology through contract C02X0501, the Better Border Biosecurity (B3) programme; M. Masciocchi and J. Corley by CONICET (Consejo Nacional de Investigaciones Cientificas y Técnicas), Argentina through grant PIP (Proyecto de Investigacion Plurianual); F. Muller, Q. Rome and C. Villemant by France AgriMer (Programme communautaire pour l’Apiculture), Fondation pour la Recherche sur la Biodiversité (Programme FRB Wasprey) and Ministère de l’Ecologie, du Développement Durable, de l’Energie et du Logement (MEDDTL). The authors thank Imogen Bassett who assisted with editing, Barry Donovan for useful discussion on biological control, and Richard Harris, Darren Ward and two anonymous reviewers who commented on earlier versions of the draft manuscript.